Rainbow is committed to being at the forefront of training the next generation of healthcare practitioners in end-of-life care. We host interns from a variety of specialties, including nursing, social work, counseling, pastoral care, music therapy and art therapy. Rainbow provides clinical rotations for nursing students that vary from one-day observational experienced to multi-week rotations with active participation. All clinical rotations are directly supervised by a Rainbow nurse in conjunction with faculty from the nursing school. Rainbow has enjoyed long-standing contracts with several local nursing institutions, and is available to students at many other institutions. Rainbow provides first year and second year graduate level internships in two clinical areas: Patient Care and Grief and Loss Services/Bereavement. Both internships offer individual and group supervision, and a comprehensive orientation to agency services and practices. In addition, both internships provide the opportunity to work with individuals and families of all ages experiencing grief and loss. Individual and group supervision is provided by licensed clinical social workers and licensed professional counselors. Rainbow accepts interns for the full academic year, as well as for block placements. 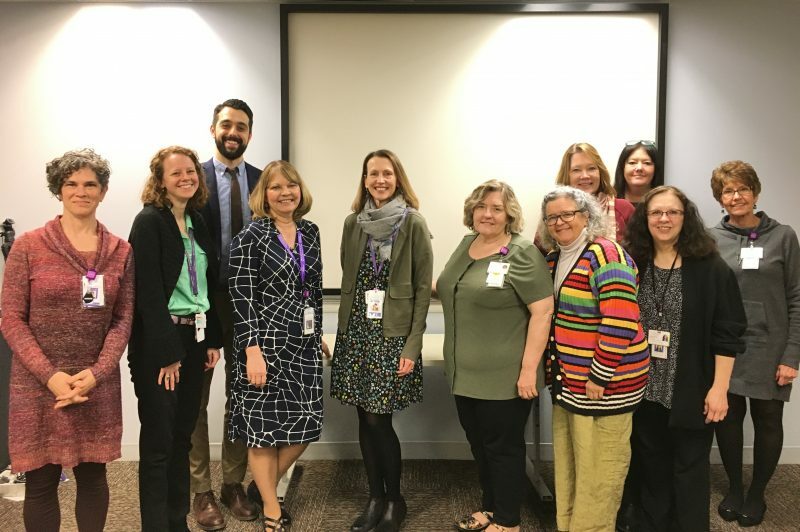 Patient Care internships offer interns pursuing graduate degrees in Social Work the opportunity to collaborate with the interdisciplinary hospice team to support individuals and families through the death of the hospice patient. The patient care internship offers opportunities to provide individual and family counseling to hospice patients and their families, and develop experience with clinical assessment, anticipatory grief counseling, advance care planning, and case management, among others. Grief & Loss Services offers a rich learning experience for master-level interns seeking a strong clinical internship. The bereavement internship offers opportunities to provide individual, family, and group counseling to hospice and community bereaved with the support of dynamic individual and group supervision. Interns may be pursuing graduate degrees in Social Work, Counseling Psychology or Art Therapy. Grief & Loss Services is host to a fellowship opportunity for social workers or counselors who are seeking advanced training in grief support and also in need of clinical hours and supervision necessary for state licensure. A Bereavement Fellow will receive education, clinical supervision, and direct clinical experience with hospice and community bereaved. Rainbow offers undergraduate internships in the areas of Patient Care and Grief and Loss. Internships provide experience in clinical assessment, development of treatment plans and evidence based music interventions, among others. Interns are supervised by board certified Music Therapists and receive a comprehensive orientation to agency services and practices. Rainbow serves as an educational site for Clinical Pastoral Education (CPE) students and pastors pursuing advanced degrees in counseling. Students in the CPE program are mentored by hospice chaplains while obtaining experience working with patients and families in Patient Care. In addition, CPE students participate in individual and group supervision in their sponsoring organization. Pastors enrolled in graduate counseling programs work with hospice and community bereaved, providing individual, family and group counseling. Individual and group supervision is provided by licensed clinical social workers and licensed professional counselors. All students receive a comprehensive orientation to agency services and practices. Clinical education can vary from a one-day observational experience to a multi-week rotation, based on a student’s individual needs. The LIFE Institute can work with the student and their educational institution to determine what type of program will best suit their needs.